The other day I went for a quick tour around the Quaker District of Old Chappaqua followed by lunch at the Jardin du Roi. The Old Chappaqua Historic District is located along Quaker Road (New York State Route 120) in the town of New Castle, New York, United States, between the hamlets of Chappaqua and Millwood. It was the original center of Chappaqua, prior to the construction of the Harlem Valley Railroad and the erection of its station to the south in the mid-19th century. In 1974 it was recognized as a historic district and listed on the National Register of Historic Places. 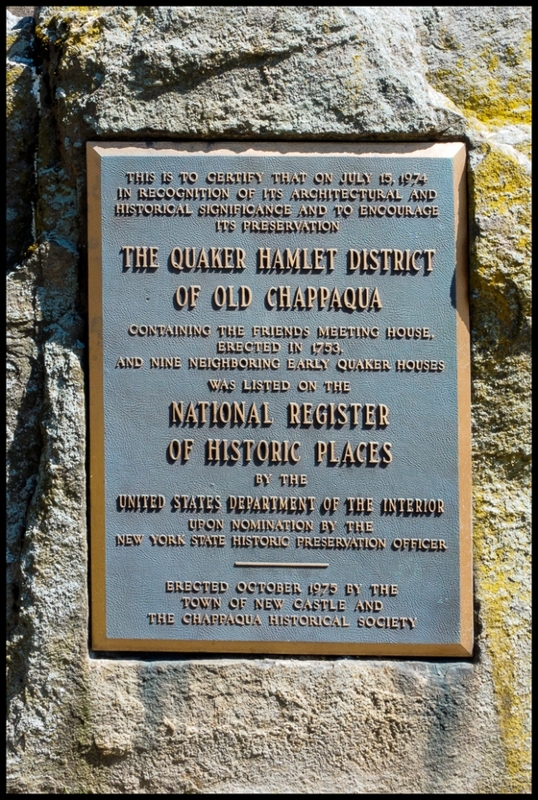 What is today Chappaqua was first settled around 1740 by a group of Quakers from Long Island. They built the still-used meeting house, the oldest known building in the town, around which the district centered a decade later. The other contributing properties, all timber frame buildings up and down the road on either side near the meeting house, are the surviving buildings from some of the farms established then and later. They have been preserved intact from that time. Quakers, fleeing religious persecution in England as Dissenters, settled in British colonies during the 17th century. One group established a meeting on Long Island in 1645. By the early 18th century their offshoots had crossed Long Island Sound to Westchester County, where they established Mamaroneck and Purchase by 1727. In 1730, further offshoots of those groups moved further inland, to Wampus Pond (now Armonk) and “Shapequaw”. Ten years later one of them, John Reynolds, established a 100-acre (40 ha) farm that included the area of the future district, along Quaker Road from Kipp Street to Roaring Brook Road. By 1747 there were enough Quakers in Shapequaw that they began petitioning the Purchase meeting to establish their own. Permission was granted shortly thereafter, and Reynolds donated two of his acres (8,100 m2) to the group so it could build a meeting house and burial ground. By 1753 the meeting house was finished. In 1776 it would serve as a hospital for Continental Army soldiers injured at the nearby Battle of White Plains. Two years later a wing was built on it. The original Reynolds farm was eventually subdivided. Other farmers, like Samuel Allen and Elnathan Thorn, built houses near the meeting house. By 1825 the area had become the community of what was now known as Chappaqua. The residents were largely self-sufficient farmers with side businesses as craftsmen. That ended with the construction of the Harlem Valley Railroad (still in use today as Metro-North Railroad’s Harlem Line) in 1846. It followed the river valley, and so the station was built a mile (1.6 km) south of the meeting house. Gradually that area became developed and grew into the downtown Chappaqua that exists today. Allen built a couple of small houses across the road from the meeting house, and cabinetmaker Henry Dodge built a large house at what is today 386 Quaker, moving the older Thorn house in the process. That was the last development in the district related to the original Quaker settlers and their families. As the railroad spurred the suburbanization of northern Westchester in the later 19th and early 20th centuries, the meeting house and associated farm buildings remained in use. However, the economy changed. With the railroad close by, the farmers switched to growing cash crops for the New York City market, and sold some of their larger landholdings. Some buildings, such as the outbuildings on the Thorn–Dodge property, were destroyed by the 1904 tornado. New construction in the district did not replace any of the historic structures. In 1961 another wing was added to the meeting house. There have been few other changes to the older buildings since then. This entry was posted in Places, Things. Bookmark the permalink.